The SHPO or State Historic Preservation Office works with issues related to historic buildings and structures, associated programs and tax incentives, and archeology. 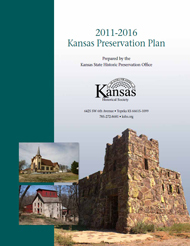 The SHPO helps to preserve, protect, and honor cultural, historical, and archeological resources of Kansas. Find more information about accessing help for owners of listed properties. Learn more about surveyed properties including historical buildings and archeological sites, and find a list of historical markers. Learn about our popular archeology programs and resources. Learn how you can make your historic building more energy efficient using simple, cost effective techniques.